SAN DIEGO,CA– AMETEK Programmable Power, the global leader in programmable AC and DC power test solutions, is proud to introduce its latest VTI Instruments IEPE Accelerometer/Voltage product: the RX0424 24-channel device with integrated tachometer inputs. The RX0424 provides exceptional accuracy for programmable data acquisition rates of up to 204.8 kSa per second. Multiple input ranges combine with independent 24-bit analog-to-digital converters for repeatable, high-resolution measurements to ensure users capture all vibration events, large or small. The new device is ideal for measuring acceleration forces, such as sensing static and/or dynamic movements. The RX0424 delivers repeatable laboratory-grade measurements to the field, with fully-integrated IEPE current excitation and tachometer input channels, further enhancing the instrument’s utility and functionality. Users can program the IEPE current excitation sources to generate either 4.5 mA or 10 mA drive current. They can also tailor the sources to specific application demands. The device’s built-in self-test diagnostics improve user test confidence by offering closed-loop, end-to-end self-calibration as well as access to the device’s memory and internal temperature information. AMETEK’s family of rugged instrumentation is designed to operate in the most extreme environmental conditions imaginable without compromising measurement accuracy or performance. The RX0424 is rated to IP66 for solid protection against dust, spills, humidity and water jets. 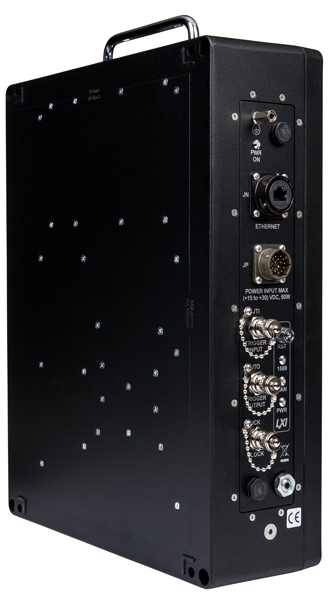 It is use-ready for virtually any environment, especially when combined with the rugged Mil-Grade connectors. Its compact, light-weight design leverages thermal conduction cooling techniques to dissipate heat without using a fan, enabling extended operating temperatures of -20°C to +60°C. It’s easy for users to distribute multiple instruments around the test article to reduce analog cabling and noise errors. Likewise, the device’s reduced setup and maintenance times are made possible by the shorter, more manageable transducer cable runs. The RX0424 achieves data correlation by using industry-standard IEEE-1588 synchronization and timestamp methodology. This applies both to its individual channels within a single instrument and to multiple instruments distributed around the test article. EXLAb —AMETEK’s user-friendly software — streamlines configuration, data visualization and analysis. The software’s open-source, industry-standard drivers and programming interfaces allow for a flexible selection of the application programming environment that is best suited to the end user’s application and development requirements. We also offer turn-key software, including EXLab and APEX DS. Email us at sales.ppd@ametek.com or reach us directly by calling 800-733-5427 or 858-450-0085. AMETEK Programmable Power designs and manufactures a wide array of precise AC and DC programmable power supplies, including electronic loads, application-specific power subsystems, precision data acquisition instrumentation as well as signal switching. The company also offers compliance test solutions for customers who value differentiated power products and services. AMETEK Programmable Power offers one of the industry’s broadest portfolios of core ATE components under the VTI InstrumentsTM, California Instruments™, Sorensen™ and Elgar™ brands. AMETEK Programmable Poweris a business unit of the AMETEK Electronic Instruments Group, a leader in advanced instruments for the process, aerospace, power and industrial markets. AMETEK, Inc. is a leading global manufacturer of electronic instruments and electromechanical devices with annual sales of $4.8 billion.